It looks like Dying Light is getting some meaningful gameplay updates in the coming months. 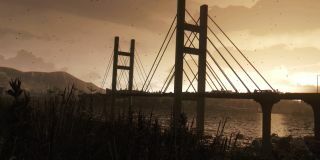 According to the above video, which currently plays when you boot up Dying Light on a PS4 (courtesy of Ethan Shapiro, via VG247) dune buggies, bows and a new parkour time trial mode are forthcoming. It's fair to say that the current map doesn't really accommodate high speed vehicles, being a fairly dense and vertical environment. The short snippets above suggest new areas will be unlocked, including a stadium (probably the Harran Stadium referenced a few weeks ago) and wide brown fields for dune buggy shenanigans. Whether these will be part of Techland's promised free updates, or paid, isn't specified in the video. Whatever the case, it certainly looks more exciting in action than it does on paper.